I turned my favorite smoothie into a waffle. These waffles are delightfully fruity with little juicy bits of peaches and a wonderful banana aroma. And there’s nothing better than a fluffy waffle drizzled with maple syrup to get me going in the morning. The route to these waffles was a little bit circuitous. Josh promised to make me breakfast, and I had told him we had a can of pumpkin. He got halfway through whipping up the pumpkin waffle recipe only to realize that I was wrong about the pumpkin. We made a thorough inventory of our pantry, and didn’t manage to turn up squash nor sweet potato in any form. With the waffle iron preheating and the dry ingredients already mixed, I was not ready to give up on my promised waffle breakfast though. So I started mashing bananas and stirring together yogurt, and put that straight into the waffle recipe. The result? Delightful. Bursting with fruit flavor, the sweetness of banana and tang of peach, one of my favorite fruit combos was beautifully transformed into a breakfast treat. We’ll surely be making these again. Turns out that our kitchen was not quite ready to herald in fall with pumpkins and brown sugar. Nope, instead we bade a fond farewell to summer this weekend, with peaches in our waffles. And I am glad to know that we can invite a little summer into our lives all winter long, since this recipe doesn’t rely on fresh peaches for its flavor. Bon Appetit! 2. Stir together flour, baking powder, baking soda, salt, and spices. 3. In a separate bowl, mash the banana very well with a fork or pastry cutter. Whisk together banana, milk, oil, sugar, and vanilla. 4. Add wet ingredients to dry mixture and mix until just combined. 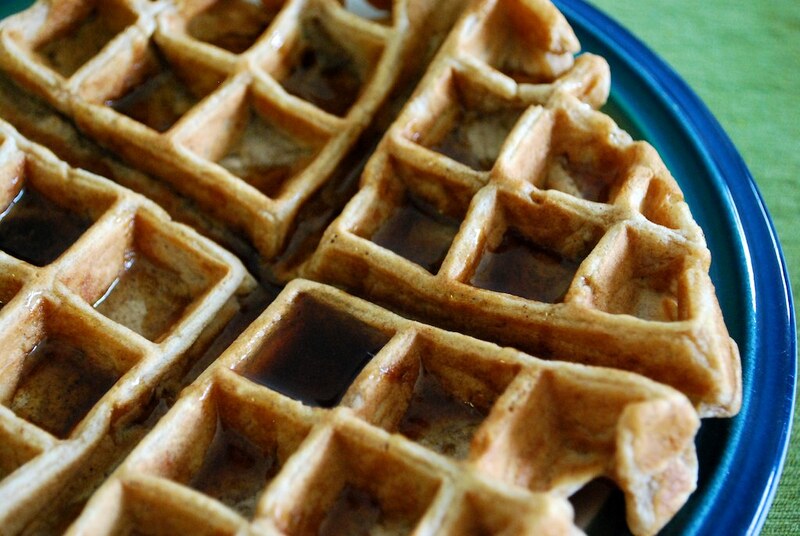 Cook waffles according to instructions for your waffle iron. NOTE: This makes a lot of waffles, but they keep well. Refrigerate leftovers for a few days or freeze them for up to a couple weeks. Heat leftovers in a toaster oven for a quick and delicious weekday breakfast. Also, I recommend using a yogurt brand that includes small chunks of fruit, like Silk soy yogurt. 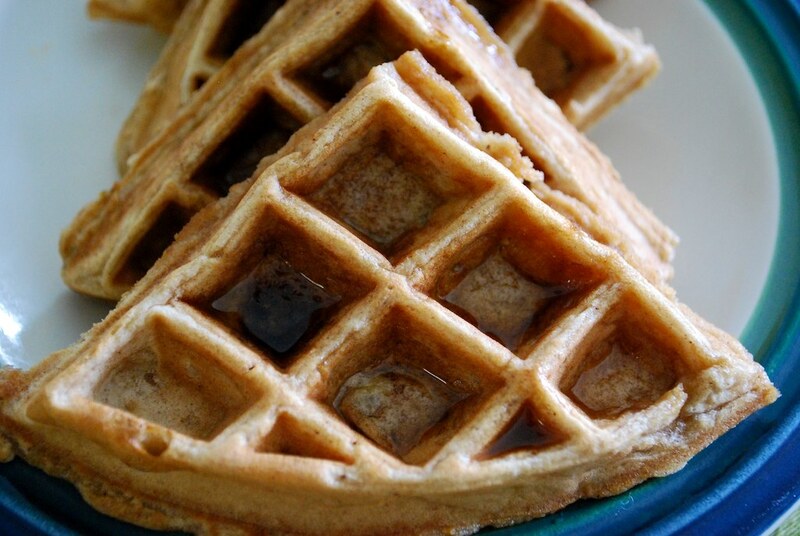 This entry was posted in breakfast and tagged banana, peach, recipe, vegan, waffle, yogurt. Bookmark the permalink. 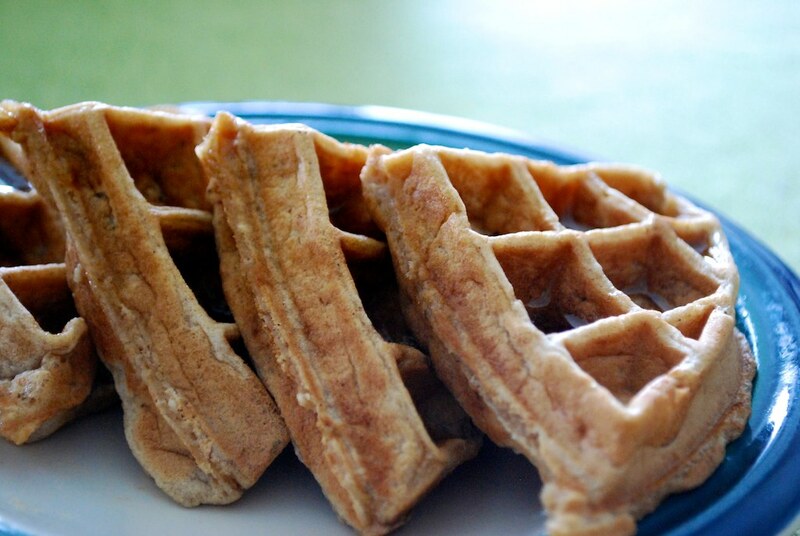 These waffles look peachy! Can’t wait to make them! Yum! They are two delicious flavours that I would love in a waffle 😀 Hurrah for a disaster turning into a discovery! I loved your first line. I was surprised by how it ended. How else could this sentence finish? 🙂 “I turned my favourite smoothie into a….” Culinary doors open with the imagination.